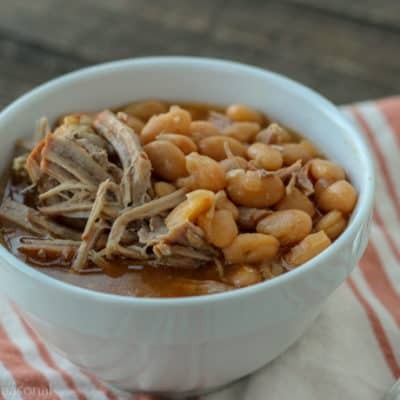 Crockpot Express Pork Roast and Beans is a classic comfort food that's also budget-friendly! Trim any excess fat off the roast. Place roast in the inner pot. Wash beans and make sure to pull out any pebbles. Pour rinsed beans around the roast. Place onions over the roast and beans. After cooking time is done, allow for a natural pressure release. Open the lid and check to be sure the meat is tender and pulls apart easily with a fork. The beans should be soft and creamy. Add salt and pepper to taste and serve up a bowl of comfort food! Stir in your favorite hot sauce before serving for a spicy kick!